The tab preview feature in Microsoft Edge displays a thumbnail glance of an open tab on mouse-over. Its usefulness is questionable, but to each their own. Tab previews have a tendency to get in the way. The thumbnail preview can obstruct features like the bookmarks bar, the address bar, and the forward, back and refresh buttons. Although no standard setting exists to disable tab previews in Microsoft Edge, it is still possible. 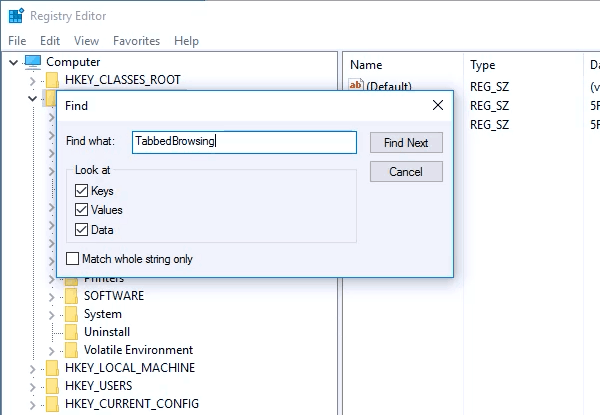 Doing so requires a foray into the Windows registry. 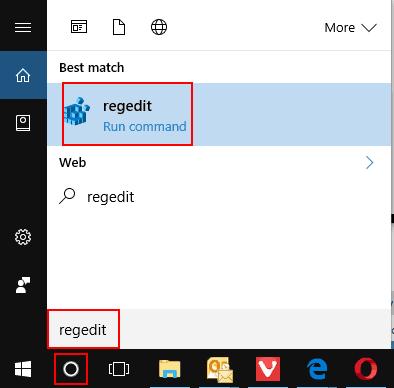 To access the Windows 10 registry, type regedit into the Cortana search box, and click regedit Run command under Best match. 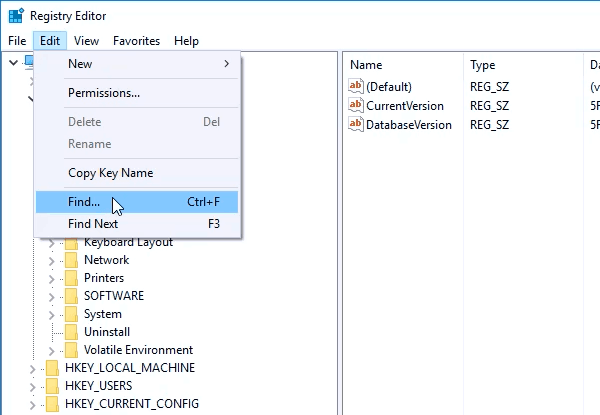 In Registry Editor, click Edit in the file menu, and select Find. In the Find what field, input TabbedBrowsing as one word, then click the Find Next button. 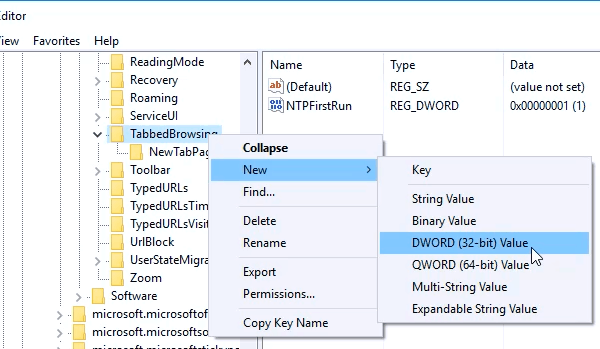 Right-click on TabbedBrowsing, click New, then choose DWORD (32-bit) Value. A new DWORD value called New Value #1 will display under the Name column. Right-click on New Value #1, and rename it to TabPeekEnabled as all one word. Right-click on TabPeekEnabled, and choose Modify from the right-click menu. 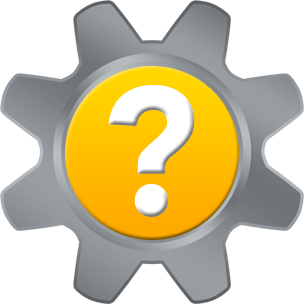 In the Edit dialog, locate the Value data field. The default value is 0 (zero) which means the tab preview feature is disabled. Click OK in the Edit dialog. Relaunch Microsoft Edge, and tab previews will no longer display. When the longing for tab previews is more than you can bear, enabling it is easily accomplished. 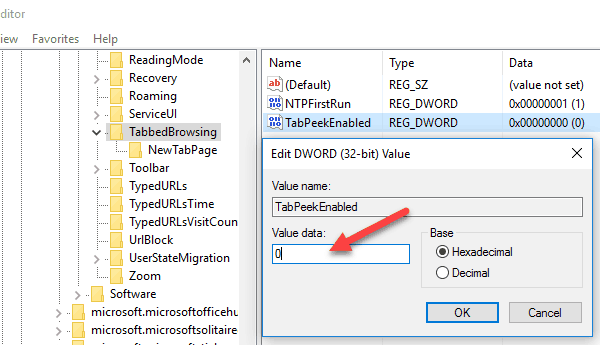 Navigate back to TabbedBrowsing, and modify TabPeekEnabled to change value data to 1 (one). You can also (carefully!) 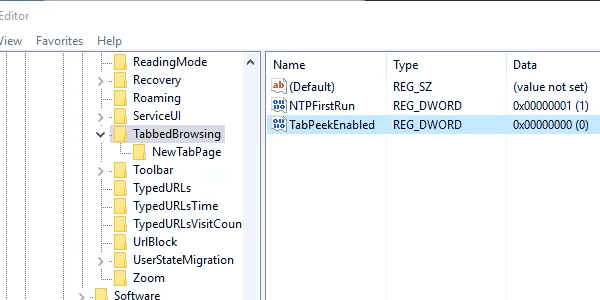 delete the TabPeekEnabled DWORD value to undo all of your hard work to re-enable tab previews. Once modified or deleted, relaunch Microsoft Edge to find tab previews present once again. 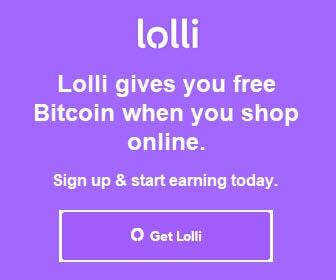 Watch our video tutorial to see just how easy it is. Thank you for visiting Tech Help Knowledgebase to learn how to disable tab previews in Microsoft Edge.